Here is a screenshot of the final label proof for our first album. Graphic designers often fail to deliver CD labels that offer all of the information that DJ’s require in easily legible form. Include company name, artist’s name, disc’s title, song titles, composer(s), publisher(s), PRO(s), the running time of each track, and copyright notice both for the compositions and for the performance art, i.e., the sound recording. 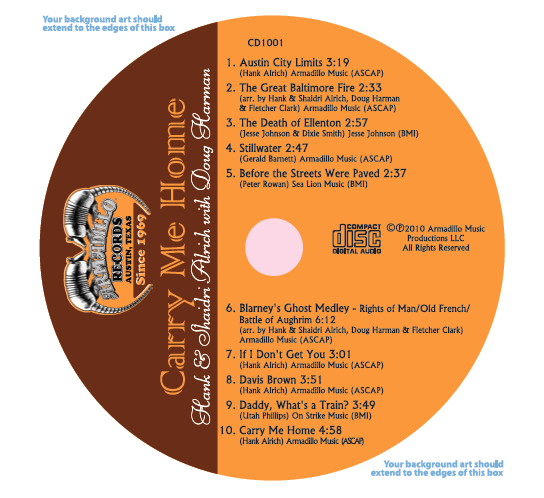 We are very thankful for the design work the late, great Bill Narum brought us for Carry Me Home, and we will maintain the formatting as best we can across future releases.